Clarksville, TN – The USS LST-325, 328-foot-long landing ship tank, will arrive in Clarksville on Wednesday, September 6th, 2017. The ship’s arrival in Clarksville is one of the many activities that are part of Visit Clarksville’s Welcome Home Veterans Celebration. The LST-325 will be open for tours beginning at 9:00a.m. on Thursday, September 7th through 5:00pm Friday, September 15th. The LST will depart from Clarksville on Saturday, September 16th, 2017. 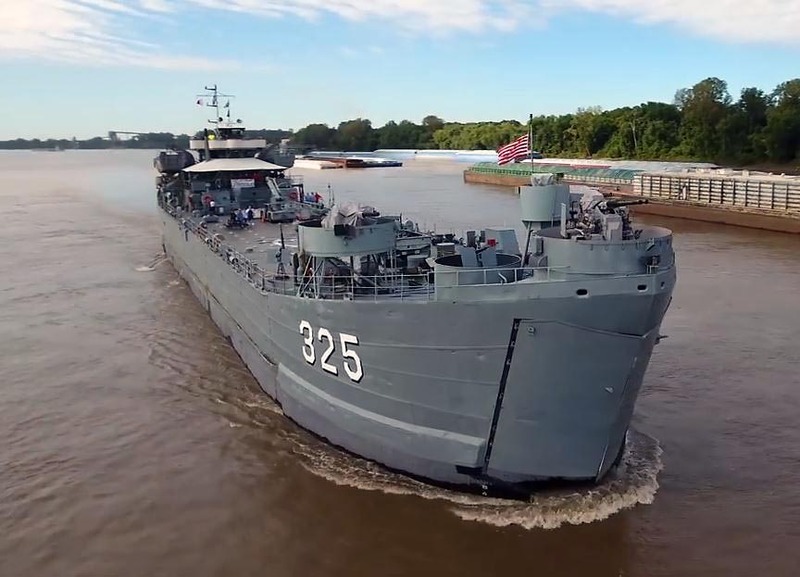 USS LST-325 to dock in Clarksville Wednesday. Tours will begin Thursday. Launched on October 27th, 1942 and commissioned on February 1st, 1943, the LST-325 been restored to its original condition. It is only ship of its kind that is fully operational in the U.S. The LST-325 is an amphibious vessel designed to land battle-ready tanks, troops and supplies directly onto enemy shores. Ships of this type proved to be enormously useful both during times of war and peace. This particular LST was originally known as LST-325 during the Second World War, USNS LST-325 during its arctic operations in the 1950’s, and later L-144 (A/G Syros) while it was in the service of the Greek Navy. It was acquired by The USS LST Ship Memorial, Inc., in 2000, and caught considerable public attention when our veteran crew brought it on a 6,500-mile journey from the Greek island of Crete to Mobile, Alabama. The crew of the LST-325 gathers for a group photograph prior to leaving Crete. 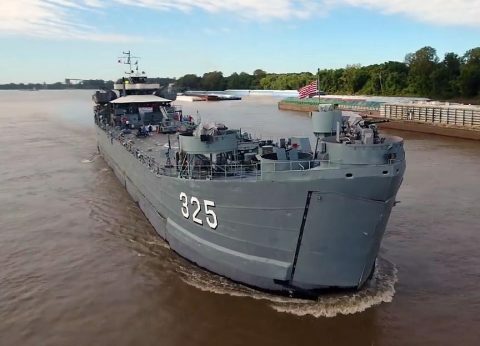 One of only two World War II LSTs to be preserved in the United States, the LST-325’s permanent home is Evansville, IN. She has become a museum and memorial ship to the men who bravely served their country aboard LSTs. A crew of WWII, Korean and Vietnam veterans will conduct tours of the LST-325 during its Clarksville visit. General admission for adults is $10.00; children 6-17 is $5.00, and WWII veterans and active duty military in uniform are free. American Traveling Tribute Wall will open for public display at Beachaven Vineyards & Winery, 1100 Dunlop Lane, at noon on Thursday, September 14th. The exhibit will remain open 24 hours a day through 3:00pm September 17th. Field of Honor – Veterans Tribute flag display will also be at Beachaven September 14th-17th. Flags may be purchased in honor of veterans or first responders from our the event website, www.welcomehomeveteranscelebration.com, at www.healingfield.org/clarksville17/ or by calling 931.647.2331. A Wreath Laying and Massing of the Colors will take place at the Wall on Friday, September 15th at 3:30pm in honor of National POW/MIA Remembrance Day. The Eyes of Freedom, an exhibit of 23 life-sized portraits will be located at Beachaven from noon on Thursday, September 14th through 3:00pm Sunday, September 17th. Operation Stand Down – Veterans Festival will be held September 13th-14th, 9:00am-5:00pm at Daymar Institute, 2691 Trenton Road. A Remembrance Ceremony at First Baptist Church will take place at First Baptist Church, 435 Madison Street, on September 14th at 7:30pm. This free ceremony is open to the public. A luncheon with Vietnam POW Bill Robinson will be held in honor of National POW/MIA Remembrance Day on September 15th at 11:00am. at the Wilma Rudolph Event Center, 1190 Hwy. 48. Luncheon tickets are $22.00 and available at www.welcomehomeveteranscelebration.com. Bob Hope Tribute to the Troops will be held on Friday, September 15th at 7:30pm at the Wilma Rudolph Event Center. Bob Hope tribute artist, Bill Johnson, and a cast of others reenacts the days when Hope traveled the world with the USO. Tickets are available at www.welcomehomeveteranscelebration.com. Welcome Home Parade is Saturday, September 16th at 10:00am. The parade begins at First Baptist Church and proceed to the Montgomery County Courthouse. Veterans should register to be in the parade at www.welcomehomeveteranscelebration.com. A Celebration Picnic and Bluegrass will take place on Saturday, September 16th at Beachaven from 12:30pm-3:00pm. Veterans are invited to this complimentary picnic lunch at Beachaven following the parade, but must have a ticket to attend. Tickets will be available at www.welcomehomeveteranscelebration.com. American Pride Concert on Saturday, September 16th at 7:30pm at Austin Peay State University’s Clement Auditorium. The concert is free, but tickets are required. Please register at www.welcomehomeveteranscelebration.com. Package tickets are also available for multiple events. See www.welcomehomeveteranscelebration.com for details. The premier sponsor for all event activities is AARP. 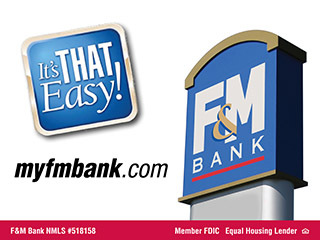 AARP members can receive an 18% discount on all ticketed events with the WELCOME50. To volunteer or participate in any of the activities or events, please contact Frances Manzitto by email at or call 931.245.4345.